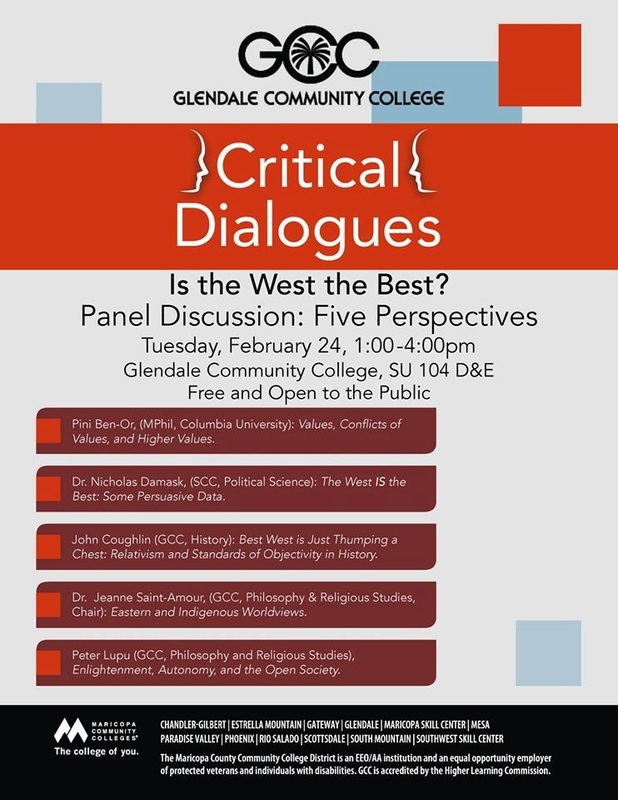 Here a few reflections on the recent Critical Dialogue at Glendale Community College entitled “Is the West the Best?” The first three speakers provided perspectives on the question itself and then the last two speakers took differing sides on how to answer the specific question. I found Mr. Ben-Or to be thoughtful in his perspective. He began by analyzing what the question might mean. What is meant by “West” and what do we mean by the term “best?” As a good philosopher is prone to do he trimmed the question down a bit. Surely we don’t mean to say that everything Western is better in every way! Mr. Ben-Or then moved on to discuss the notion of Western values and how they function as being the best candidate for what is at issue. He also discussed the reality that values are ranked and that there can be a conflict of values. He argued that it is more important to make reflective decisions rather than right decisions. He furthered argued that a better question than “Is the West the best?” is: “How do we make the West and the world better?” I grant that may be an important question—perhaps a “better” question—but the original question is still important. Mr. Ben-Or ended with a two points of evidence pointing to the objectivity of values. First, there is a convergence between utility and principle. Here he mentioned the issues of torture and capital punishment. Torture is often seen by many to be principally wrong. Furthermore, many are also seeing that the utilitarian function of torture is not very good. This convergence, according to Mr. Ben-Or, serves to evidence the objectivity of values. The second piece of evidence was the fact of moral progress. It is recognized that this moral progress is not very smooth but, nevertheless, there is moral progress on various issues throughout history. Whereas Mr. Ben-Or was deliberate and nuanced in his presentation Mr. Coughlin came out swinging with an aggressive and fast-paced style of presentation. He began by calling the question “meaningless” and began to mention a quick taxonomy of relativism—descriptivist relativism, meta-ethical relativism, and normative relativism. He argued that any perceived objective values are merely externalized values of inner subjectivity which we then turn around and impose on ourselves and others. Although he began with this brief philosophical argument the bulk of his presentation was taken up with a historical list of failings of American culture and politics. This makes sense in that Mr. Coughlin is a historian. His argument seemed to be that even if there are objective values the West (i.e., America) has so badly failed to live up to these values that the notion that the West is best fails. During the interaction period Mr. Coughlin continued this line of thinking. He referred to America as one massive wealth transfer program that generates resources for the hegemony. I was not impressed with Mr. Coughlin’s arguments for relativism and he came across as angry. (1) Objectivity: The are objective values in the realm of the true, good, and beautiful. (2) Fallibilism: We are not omniscient and what we think we know is vulnerable to refutation. (3) Knowledge: We believe that we know some things. Dr. Lupu mentioned that two types of groups reject (2) above: dogmaticians and revolutionary idealists. The one holds to tradition infallibly whereas the other is willing to throw away all tradition. Dr. Lupu argued that there is a method that accepts all three premises above—Critical Rationalism as developed by Karl Popper. Dr. Lupu defined critical scrutiny as the ability to adjust our tradition in light of new problems. This objective method gets one closer to truth. This objective method requires an “open society” that has institutions that promote critical scrutiny at all levels. The more open the society the more open it is to critical scrutiny at all levels. Next, Dr. Lupu turned to a brief argument against relativism. He noted that differences of opinion do not logically entail the conclusion that there are no objective standards. Relativists, on the other hand, reduce disagreements to differences which are neither true or false. These differences, according to the relativistic philosophy, are simply due to one’s background formation. This entails that relativism reduces to some form of biological or physical determinism. Dr. Lupu noted that if we cannot ask if something is true or false then all we have are processes. Thinking is reduced to the same epistemic level as digestion. In light of these criteria Dr. Damask argued that the West is the best at fulfilling human flourishing. He added that the competition is “not even close” when measured by his criteria. Dr. Saint-Amour defended a Buddhist/native American worldview in her presentation. She argued that progress shouldn’t be measured by physical realities but, rather, by how we live and relate to each other. She denounced the soul/body dichotomy and opted for a worldview of radical monism in which she announced that “all is one.” In light of this she urged that everything should be treated with respect. She mentioned, as an example, the podium before her and the trees outside. Dr. Saint-Amour stated that we need to get in “the flow” of existence. She urged upon the listeners the values of compassion and harmony. She sees the West as greedy and pursuing unsupportable lifestyles. An Eastern worldview would, according to Dr. Saint-Amour, provide a different lifestyle with superior values. In her answer Dr. Saint-Amour spoke of how differing worldviews have to use language in different ways to communicate. She gave examples of how Western missionaries mistakenly imported their notions of deity into certain Native American words for transcendent beings. When she asked if this helped in answering my concerns I had to answer in the negative. I responded that I understand the differences between languages and how words can have differing meanings. My concern was not about semantics but about self-contradiction. If I were to use philosophy as a means to get at truth then one of first worldviews that I would reject should her viewpoint since at the heart of it there is a major contraction between radical monism and the values she wants to affirm. Overall, this Critical Dialogue was a great experience. It is wonderful to see important ideas being discussed in a civil and rational manner. This kind of dialogue can only be a good thing for the collegiate community and for the larger community around Glendale Community College.